Another year of July 4th fireworks and family picnics may be over, but if you visited your parents for the summer holiday and hadn't seen them since Christmas, you're probably still replaying the week's events. Many caregivers have been where you are, whether there are months in between your visits or mere hours. For Ross Schriftman, it was almost like a switch clicked on with regards to his mother who lived with Alzheimer’s. Ross recently released a film about his caregiving experience, My Million Dollar Mom (based on his memoir of the same name). He was devoted to his mother and served as her primary caregiver for many years, even as his political aspirations were growing. As is often the case with a dementia diagnosis, Ross's mother had good days and bad days. She even had many Transient Ischemic Attacks (TIAs, known as mini-strokes), but remained extremely active — as she had been before her diagnosis — for most of her life with dementia. "She was always moving," says Ross; however, as time went on, she'd fill glasses with water, then put them in the freezer. She'd get the mail, then put it in the dryer. She'd take her good china sets out of the cabinets, then place them on her bed. It got to a point where Ross would come home from work and have to spend nearly two hours clearing the clutter she had created. “I knew I needed more than just me,” he said. Caregivers like Ross Schriftman and Lynn Brown do have an advantage in living close to their older loved ones. But their proximity does not minimize the need for creating a large village of care and support when a loved one's needs have moved into a different category. 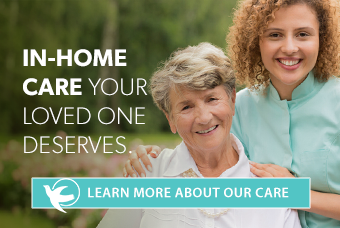 When those needs have intensified beyond the point of being met by just one family caregiver. However, if you’re a long-distance caregiver and concerned about a parent you just visited, the advantages of today’s technology can improve your situation. And there are steps you can take — even from afar — to coordinating and implementing care for an aging parent. As Ross and Lynn's stories show, things can change drastically in a short period, even after a slow and gradual decline; however, coordinating care takes time. Getting to know a professional caregiver and finding the best fit doesn't happen overnight — even if Dad's decline does — so as you begin to see the signs or changes of any kind, get the process started. Because so many people playing the role of caregiver are trying to balance their own family’s needs or maintaining a job while providing an increasing level of support to aging parents, they often end up being reactive instead of proactive when it comes to enlisting home-based care, says Jacqueline Lewis Keefauver, PT, DPT with FOX Rehab. But the sooner you can bring in support from a professional care provider — a home care companion, physical therapist, occupational therapist, etc. — the longer an older adult can maintain independence at home. Having another person observing the changes in Mom or Dad with you — especially when that person comes with specialized training, education, or expertise in working with seniors — also streamlines the process of getting much-needed help. You may even find there’s an easy fix to Mom’s latest challenges. Jacqueline, a professional caregiver, recalls a client whose mother was experiencing more clumsiness and near falls than usual. She had diabetes, and as diabetes progresses, it often leads to a loss of sensation in the feet/legs, making balance an issue. After an appointment with the podiatrist, she also discovered painful calluses on her feet; once removed, her balance improved dramatically. Another client became very confused seemingly overnight. Further testing was recommended, and she was diagnosed with a urinary tract infection, which was the cause of her confusion. An antibiotic resolved it quickly. If you’re only able to visit Mom every few weeks, realize the value of bringing in home care services and support. Beyond the benefits of companionship, professional caregivers can be another set of eyes and ears to witness cognitive changes, mood swings or personality changes, a decreasing appetite or activity level, or other signs of decline or illness. With an established relationship and rapport, the opportunities for making gains and maintaining a desired level of wellness and independence — instead of the other way around — is much more easily accomplished. The reality is, problems with our aging loved ones can catch us by complete surprise. Read another man’s story here about what he encountered at a family friend’s funeral when he ran into a former mentor.